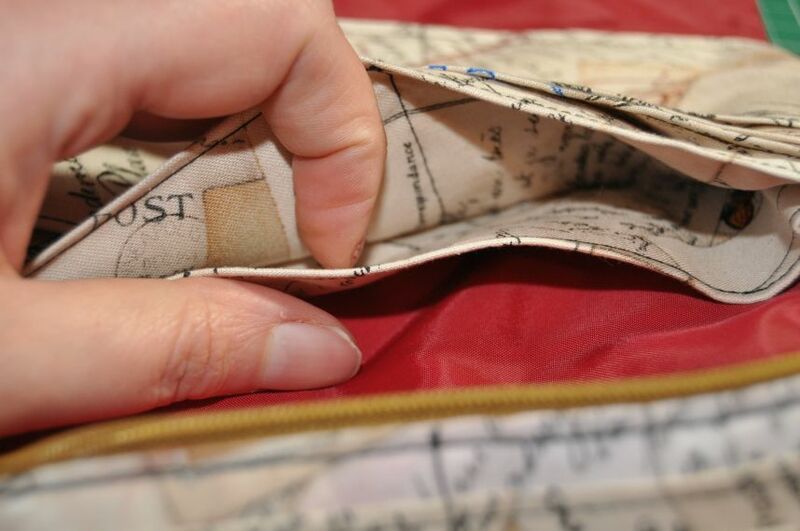 Mother’s Day is looming on the horizon and I know mum could do with a new purse and phone case. After my recent experiments with iron-on vinyl, I thought this would be a good practical application of it. I apologise for a lack of progress shots here; I was mostly fumbling my way through this one and forgot about my camera in the general stew of trying to figure out what the crap I was doing at any given moment. After some rummaging around on the interwebs, I found a couple of tutorials (well, one that referenced another) that looked as though they might result in something mum would like using. However, neither is particularly clearly written, and during the later stages I ran into some definite issues, which were almost certainly made worse by my modifications to the general design but I think they would have caused problems anyway. The tutorials I loosely followed are here and here. The initial stages of creating the card pockets and adding interfacing and vinyl to the outer layer went pretty smoothly, once I’d made a decision to convert all measurements (mostly) to inches – don’t get me wrong, I love me an SI unit, but not when all my quilting rulers are in imperial! However, I could only get hold of some mid-weight woven iron-on interfacing at the local shop, and I don’t think it has the firmness I was looking for. It’s odd stuff, I think it could be good for some things but it doesn’t work well here, unfortunately. I reckon even fusible wadding might have been a better bet. I liked the idea of adding a flap, but didn’t like the idea of using a hairband, so I decided to use a flap plus a magnetic snap (which I installed the wrong way around because I can be quite daft at times). Initially I wasn’t going to bother with the patchy strip on the outside, but then decided that the outside really needed another pocket and realised that it was also going to be too short for a decent flap if I didn’t, so I used an unpieced strip of a contrasting fabric and added in a small lined pocket. That’s a bit I’m pretty pleased with, actually. The zip isn’t quite a concealed zip (I think it’s the wrong kind for that), but I’m quite happy with how the whole thing worked in the end. 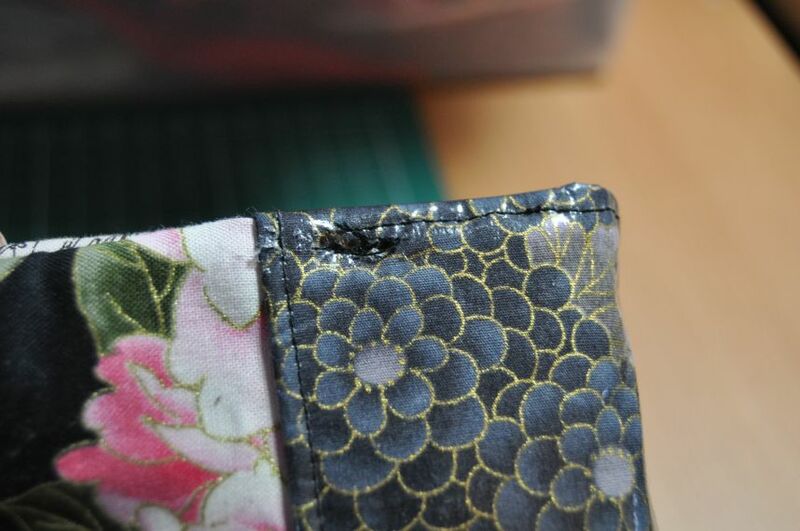 I also didn’t like that the original tutorial didn’t bother to line the interior zipped pocket, so I arranged for a proper lining for mine, to match the lining of the purse and the outer zipped pocket. Again, I’m pretty pleased with how that came out as a general concept. You could stash a LOT of loose change in there! And I added in an extra separator flap behind the other set of card pockets to act as a divider between… whatever, really. Notes and receipts, perhaps? Well, part of the problem is the depth that I left the card pockets at. I used a WOF strip cut it in half to make the two card holder strips, and measured the pockets (in cm) from one end as described in the tutorial because for this it didn’t much matter whether I used inches or cm as long as the pocket width matched the purse width. 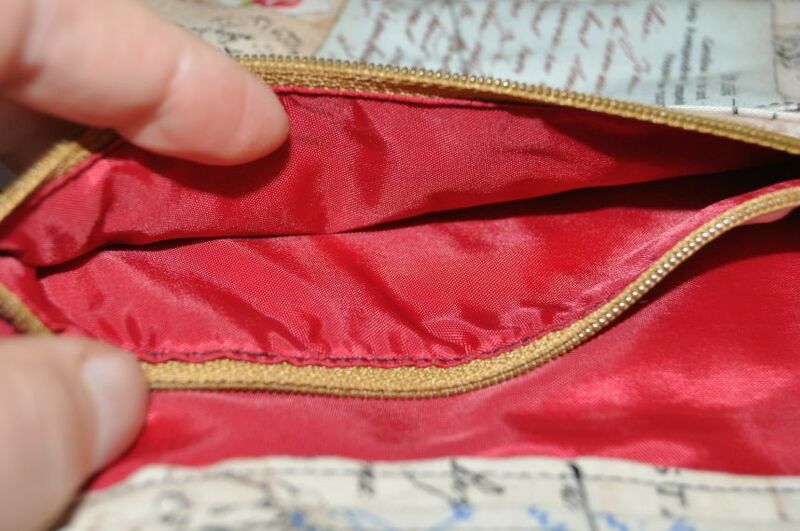 There was only a slight excess of fabric after all the pockets had been marked and folded, which I trimmed back to meet the shorter end, but the overall depth of the card pocket sections still seemed pretty deep – too deep, really. I could probably have trimmed them back about 1″ and they would have been fine. I guess the original tutorial didn’t do this because they added a magnetic snap in that excess fabric? Maybe? 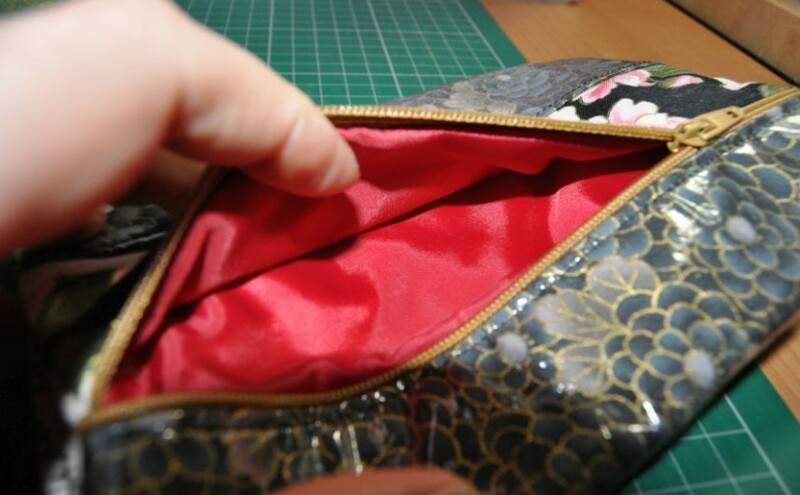 Anyway, that depth makes this “purse” begin to look more like a mini handbag – it’s giant! And even with the extra strip added to the outer cover, the outer still came up looking a bit short. So, not awesome. And that’s before I tried to make a pointed flap which didn’t really come out as I wanted because there wasn’t really enough fabric. The whole thing also feels really floppy, even with the vinyl on the outer cover. It really, really needs a firmer interfacing. Lastly, there’s the way the outer, lining and pockets are joined together. 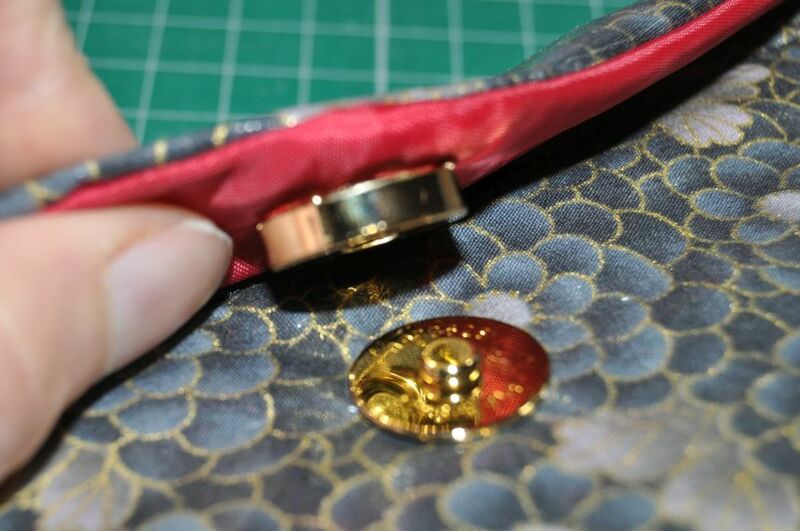 In the tutorial, the pockets are basted to the liner, then the liner+pockets and the outer are placed right sides together and a seam is sewn around the edges with a gap for turning through. 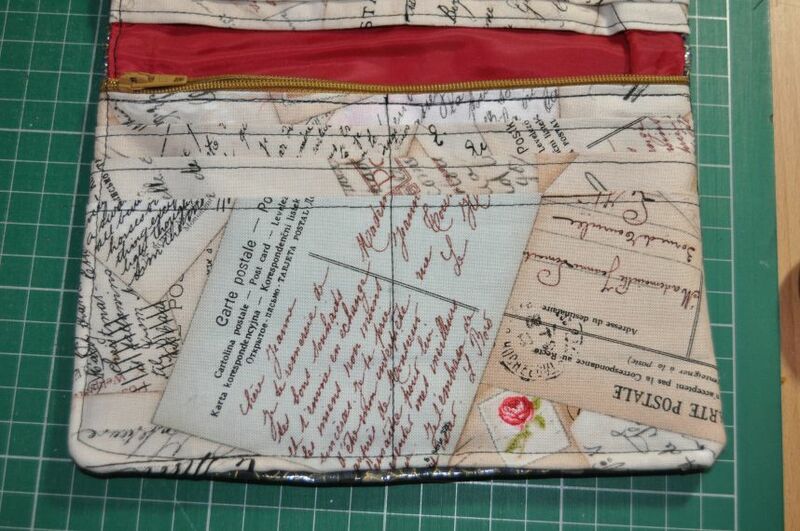 The whole thing is then turned through, pressed and topstitched to close the gap and give that all-important finished look and feel (the original tutorial only topstitches the turn-through gap, but my feeling is that the whole purse needs it, really). Fine… but. The folds of the card-holder pockets generate a LOT of bulk even when there’s only one layer, with no outer/liner and no zip to contend with. Sewing a seam and then turning through creates a double thickness of an already chunky thickness of fabric; even the Pfaff threw up its hands in despair and disgust when asked to topstitch through that lot, and I don’t blame it! And the topstitching failure has made a right mess of the vinyl, too. 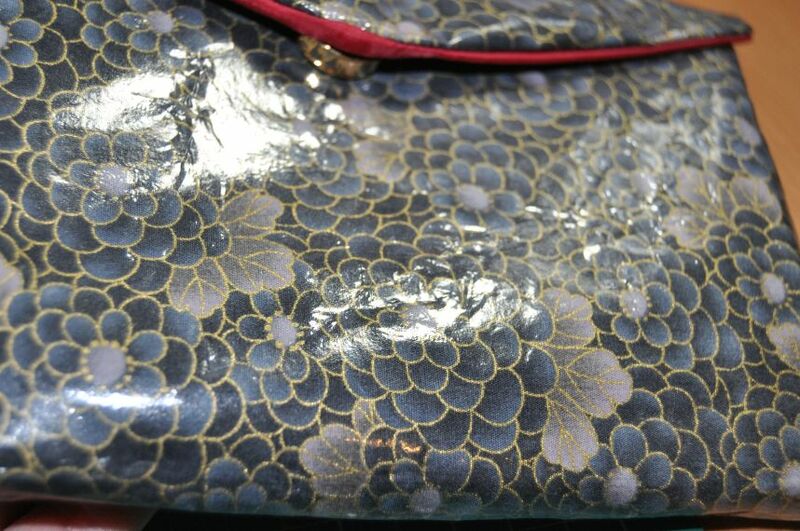 Lastly, turning vinyl-covered fabric through a small gap creates some really ugly creasing that’s just not something you’d want to show off to anyone. Bleh. Also, yuck. Do not do this. A much better method (and one I might have used if I’d bothered to engage brain) would be to place the outer and liner wrong sides together after basting the pockets to the lining and go around them with some bias binding in a complementary colour; you would avoid massive excesses of seam bulk and zips and the finish on the outer layer would not end up creased to hell and back. 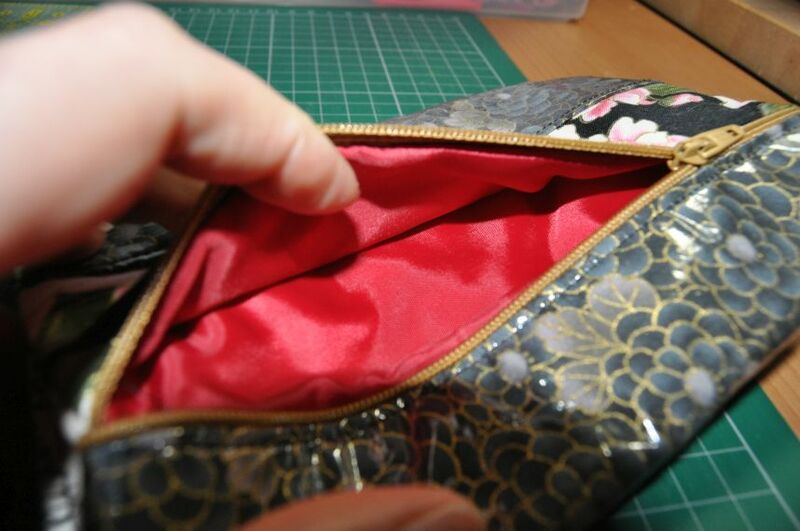 This would also avoid the distortion of the lining and interior pockets caused partly by the big fat chunky seams. In short, I’ve wasted a good day’s sewing and some nice materials to discover that this is definitely not a good way to make a purse! But it has been educational, and learning something new is rarely a bad thing. Or so I’m telling myself! :p I think it may still be possible to salvage something from this mess (I would be sorry to lose all my efforts on the card holders and zipped pockets), and I still need a Mother’s Day gift for Sunday, so I will be unpicking some of this to reuse in a more effective item. More to come soon, I hope! Oh my! What a hard-earned lesson. So sorry those tutorials were not clear and apparently led you in a very wrong direction! You have a lovely sense of humor about it all though and good things will surely come out of this somehow. Hugs my friend! *hugs back* Thank you! I’m going to go and attack it now with the seam ripper, see what I can rescue. 🙂 I think it’s important to share when things go wrong – I always learn much more from mistakes than from the “perfect” projects where everything went to plan, and if someone else can learn from my ooops as well, then even better.